Gideon had come home at last. Lady Meriel Copley—Merry to her family—stood unnoticed in the doorway Christmas morning and stared at Gideon Thornton, the Duke of Ashford, home after three years in the cavalry in India. He was the dearest friend of her brother, Philip, the Duke of Staunton, and now he stood surrounded by members of her family, her widowed mother and her younger siblings. The wax tapers perched in the Christmas tree lent a festive glow to the scene. She was glad none of them noticed her, for she could gaze at the smiling Gideon without hiding the love that was surely beaming from her eyes. She’d spent her life longing for him, even as she, an awkward bluestocking, knew she could never have him. He was too handsome, with his dark wavy hair and brilliant blue eyes, his features as chiseled as a statue’s. His face held differences, too, more lines near his eyes, his cheekbones hollow, as if service to his country had altered him. Yet he would return to moving with ease through Society, where she wanted to be buried in her studies and her research. Gideon, as a powerful duke, a horseman and outdoorsman, was meant to be the center of focus, and the woman he’d begun courting three long years ago would be his perfect match. Not Merry. But she didn’t pity herself. She would be content with their friendship, with the way they could discuss any topic in their letters. Every letter was precious to her, now tied together with ribbons and hidden away in her room. He glanced her way, and his radiant smile seemed to momentarily soften. She returned that smile with one of her own, and they came toward each other, and distantly she realized their families began to meander toward the dining room for Christmas breakfast. “Merry Christmas, Merry,” he said softly. The twinkle in those blue eyes faded into an intense look she couldn’t decipher, as if he stared into her very soul. She wanted to gaze at him in wonder, to revel in the special feeling of being with Gideon, but she had more control of herself than that. She reached out both hands to him, but instead of politely taking them, he swept her into an embrace. With a gasp, she felt the warmth and strength of his broad chest, and melted inside. Surely his behavior was because of his long absence from family and home. And it was Christmas. Her toes literally swept the floor before at last he settled her back to her feet, pulling away to look down into her face. And then she saw the mistletoe hanging above his head, and she grew hot with embarrassment, as if she’d be accused of placing it there. He tipped his head back to follow her gaze, and then met her eyes again. They seemed to be in their own little world, a dream she’d awaken from. And then he kissed her. She’d never been kissed, hadn’t imagined that the gentle warmth of Gideon’s lips could make her shiver and sway with weakness. What was he doing? He’d never been the sort of man to tease. And then she heard another man clear his throat, and Gideon let her go. Her brother, Philip, stood there, wearing an ominous frown, and she suddenly remembered his reputation for ruthlessness. Sarah, her youngest sister, stood behind, hand over her mouth, eyes wide with shock. The heat of the kiss now changed into one of mortification. Gideon and Philip stared at each other, unsmiling, and she felt trapped between them. But with a motion of his hand, he cut her off. Never before had she truly realized that Philip, the brother who’d once teased her with spiders and frogs, was her guardian. She was suddenly frightened. “Please leave us,” Gideon said solemnly to Philip, who hesitated, his body tense, before stalking from the room. He put his fingers lightly over her mouth, and the shock made her words stumble to a halt. “One kiss, and you’ll allow yourself to be trapped with a woman you don’t love?” She hugged herself, feeling suddenly so cold. “It doesn’t matter what I think. I won’t marry you, Gideon, and there’s nothing my brother can do to persuade me.” She felt the threat of tears, and knew she couldn’t break down in front of him. So she ran from the drawing room and fled up the stairs. Alone in her room, strangely dry-eyed, she tried to analyze everything that had happened. He’d proposed because he felt sorry for her. And Philip—had he been relieved to at last marry off the sister whose only suitors were impoverished young men or widowers with motherless children? Gideon was her friend, and she didn’t want to lose that. Somehow she would make him see she’d be fine on her own. 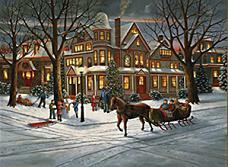 She crept back downstairs, past the dining room where she could hear happy Christmas laughter, to the drawing room where the door was ajar. She heard raised voices. “Of course you’re going to marry my sister!” Philip insisted. Merry covered her mouth in dawning realization. Gideon was taking the blame, trying to protect her from her brother’s wrath. She gaped at the door, about to push her way in, when she heard Gideon groan. Merry felt her shock and horror fade away into a momentary bleakness. She didn’t want to marry like this—forced into it for the sake of avoiding scandal. Her anger surged along with her determination. She gave a brisk knock, then pushed open the door. The dukes turned to stare at her, and ignoring the rush of love she felt for them, she hardened her resolve. She shot her own ferocious frown at Gideon, who crossed his arms over his chest as he studied her. She was about to protest that she made her own decisions, when Philip interrupted. Out of the corner of her eye, she saw them glance at each other, helpless to object without ruining their plans. And then she saw her brother’s little smirk of superiority, the one he always thought he hid so well. He assumed she’d be the one to back down—but he’d be wrong. She swept to her feet and out to the entrance hall, only setting down the pistol box to throw on her cloak. The butler watched wide-eyed as the two men fell in line behind her. The day was overcast, and faint snowflakes had already begun to whiten the grass, but she marched through it, leaving footprints behind. Inside, her emotions were a jumble of anger and humiliation and pride. “Merry,” Gideon began in a placating voice. She wanted to glare at her brother—did he really think he knew everything about her, that she’d fall into line with whatever he said? The stables were deserted as the servants gathered in the mansion for their own Christmas feast. The yard beyond, between the stables and the coach house, was barren but for the thin coating of snow. “What’s wrong?” she demanded, struggling to keep the emotion from her voice. “You obviously don’t mind hurting me, or you’d never have agreed to this ridiculous duel. And who are you both to assume I can’t defend my own honor?” She pulled out a pistol, dropping the box to the ground, backing away, and aiming at them both. She pulled the trigger, and they both jumped at the small explosion. “You missed!” Philip said with astonishment. Gideon’s sudden smile turned into a chuckle. He stalked away, leaving her alone with Gideon, who still wore a tender smile that made tears flood her eyes. Suddenly bewildered, Merry said, “She never married in all these years. I can’t believe…” Her words trailed off. She relived her memories of Lady Augusta, and now saw a subtle desperation she’d mistaken for sadness at being parted from Gideon. Her own breath caught in a gasp as she gazed up at him. “I was supposed to tell your brother that I love you, before I even told you?” he continued, practically lifting her to her toes as he pulled her close. She whispered his name, tears falling in earnest. “Oh Gideon!” She flung her arms around his neck. They clung to each other, snow falling softly, masking the sounds of London but for their breathing. “Then it will be a Merry Christmas after all.” He kissed her again.